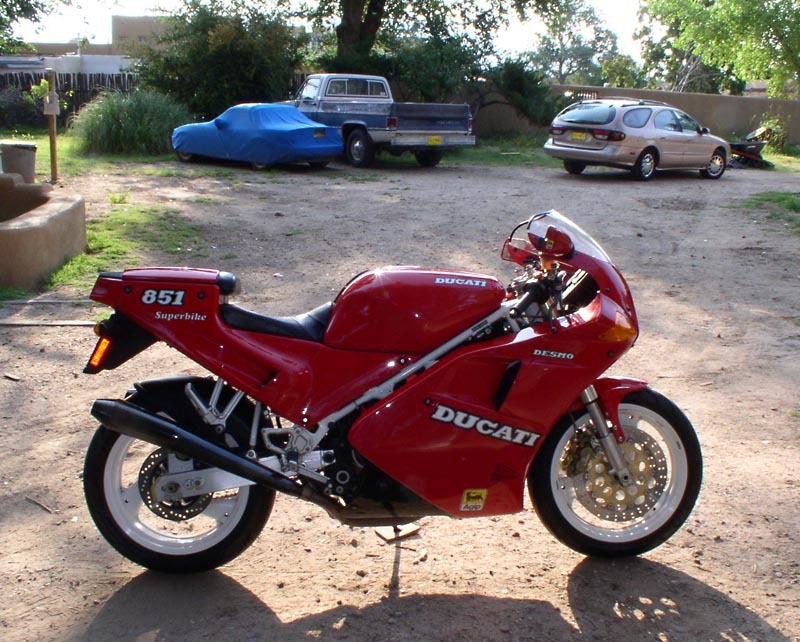 The Ducati 851 came out back in 1988. Monroe Motors on Valencia Street had a few of the tricolored models in stock. I was totally and instantly smitten. They were truly the bike that saved Ducati, first on the track and later in the marketplace. They also cost about $20,000. Once the limited-edition models proved a sales success, Ducati made some concessions in the interest of cost and reliability. Notably, the wheels grew to 17 inches, increasing stability. The full floating discs were replaced on the "Strada" editions with semi-floating discs. But by 1991, a stock 851 was in performance terms every bit the motorcycle that the earlier Superbikes were, at half the cost. Limited-edition models were given upgrades along the way, and so a 1991 Strada is hardly the most desirable model. But it is plenty of bike for any road, and certainly for me as a rider. Two weeks after this first visit, Il Pompone hosted a Ducati festival at his restaurant, and one of the highlights of the assembly was a tour of the Ducati factory in Bologna's Borgo Panigale and an audience with famed Ducati engineer Fabio Taglioni. So back down we went. At left are a few of the pictures I snapped that day. Ing. 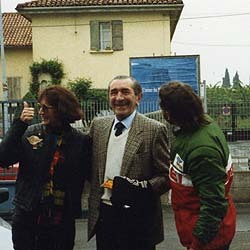 Taglioni received adulation from the assembled Ducatisti, and a t-shirt from the New Zealand Ducati Club which featured his desmodromic design. He then signed about a dozen gas tanks, my leather jacket, and a bunch of Ducati t-shirts. I still have both the jacket and the shirt. Awe and appreciation filled me as I witnessed first-hand the assembly of completed motorcycles from the bins of parts that Ducati received from its suppliers. It was an industrial education, akin to a beer drinker's tour of the Guinness factory at St. James' Gate. It has been a decade and a half almost two decades since I was in Italy that first time, but I have searched for an 851 I could afford ever since. In the meantime, I was baptized in Ducatidom by a 900 SD Darmah that a friend of mine was not bringing with him to New York. Thus was I acquainted with the charms that Ing. Taglioni invested into the desmodromic motor. Eventually, I too decided not to move with the Darmah, and I sold it to a German fellow for what I paid for it. 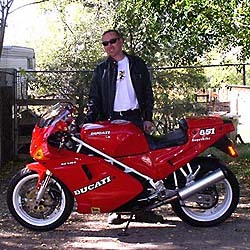 Soon after arriving in New Mexico, I obtained the bike of my dreams on eBay, and I could not have been any happier than I was riding it home from Santa Fe on a cold clear September morning. At 15 years old and under 7000 miles on the clock, the 851 and I were set to grow old together. Update: Almost two years and nearly 2000 miles later, the 851 and I are happier than ever. I recently obtained NOS Conti reverse cones (stock on the 851's I fell in love with in 1988). Here is a more recent picture of the 851 with the 4-wheeled contingent of the fleet. However, Moto Lust Italiana is never sated, and so I have acquired a 750 Sport to complement the 851 as a daily rider and to serve as a second bike when friends come to visit. ¹ After watching the video Ducati: A Story of Passion, I understand that the Ducati factory floor (and its employees) are available without a reservation ahead of time. It appears as though Ducati finally understands its passionati.